Work and Pensions Secretary, Amber Rudd, has said history will take “a dim view” of ministers if the UK leaves the EU without an agreement. Ms Rudd told a cabinet meeting earlier that the UK would be less safe if there was a no-deal Brexit. Business Secretary Greg Clark has also told MPs a no-deal exit in March “should not be contemplated”. MPs are set to consider later a measure which may restrict the government’s tax powers in the event of a no-deal exit. The government has refused to rule out leaving the EU without an agreement and is continuing to make contingency plans. Transport Secretary Chris Grayling told the Commons that ministers would be accused of “irresponsibility” if they weren’t planning for all eventualities. Brexit Secretary Stephen Barclay has cast doubt on claims UK and EU officials are talking about delaying Brexit if MPs reject Theresa May’s withdrawal agreement. The PM will meet a delegation of cross-party MPs who believe that a no-deal exit would be disastrous for British industry, more than 200 of whom have urged her to rule it out. Mrs May appears to be facing a growing backlash against a possible no-deal Brexit – if her agreement is voted down next week. 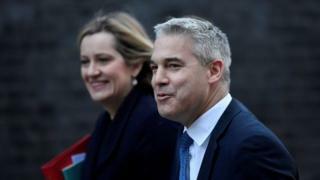 It is understood during Tuesday’s Cabinet the Work and Pensions Secretary Amber Rudd told MPs history would take a dim view of the government if it accepted no deal and it would leave the UK a less safe country. And the Home secretary Sajid Javid said no deal would limit the government’s ability to return illegal immigrants to other EU countries. Later in the Commons, Mr Clark told MPs a no-deal exit “should not be contemplated” because of the likely impact on business. Business Minister Richard Harrington became the first minister to publicly say he would resign if the government pursued a no-deal exit and told the BBC others could follow suit. Meanwhile, the Brexit Secretary Stephen Barclay said the UK remained committed to leaving on 29 March. According to the Telegraph UK officials had been “putting out feelers” about extending Article 50, the mechanism taking the UK out of the EU. Mr Barclay said he had not spoken to the EU about that and any delay would cause “some very practical issues”. His remarks came the day after Digital Minister Margot James suggesting Article 50 might have to be extended in order to stop a no-deal Brexit if Mrs May’s deal is rejected by Parliament. The BBC’s Brussels reporter Adam Fleming said extending Article 50 was the “default” back-up plan for the EU if MPs did not agree to the Brexit deal, although he was not aware of any officials who had discussed it at this stage. 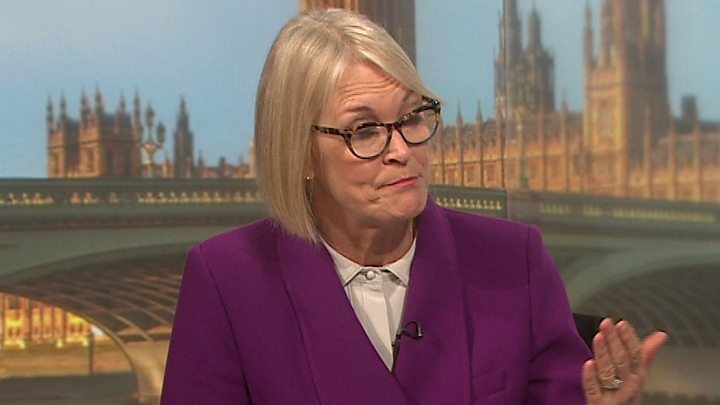 Media captionMargot James: “We might have to extend Article 50”, but would not give a timescale. But Mr Barclay told BBC Radio 4’s Today programme: “It’s not a unilateral decision for the UK. That is not a decision the UK government could take, it would require the consent of all 27 member states. Mr Barclay said the “real question” facing MPs when they vote on Mrs May’s deal next Tuesday was between leaving with Mrs May’s deal or “no deal”. David Davis, one of Mr Barclay’s predecessors as Brexit secretary, told the BBC the fact that EU officials were talking about re-opening negotiations “tells you that Mr Barclay’s assertion that this is the only deal on the table is not, actually, entirely accurate”. “Because what actually is going on, is the Europeans are thinking about the next stage, and the next stage is another round of negotiation,” he told Radio 4’s Today. He said delaying Brexit for more talks would be a “bad idea” – and the UK should hold its nerve and force the EU back to the negotiating table to get legal assurances and “some sort of undertaking on a free trade deal”. He was speaking after Irish premier Leo Varadkar said the EU would offer the UK government fresh assurances on the Withdrawal Agreement to help Theresa May get her deal through Parliament. He added: “We don’t want to trap the UK into anything – we want to get on to the talks about the future relationship right away. Meanwhile, a cross-party group of MPs, headed by Labour’s Yvette Cooper and Conservative Nicky Morgan, will later attempt to make it harder for the UK to leave the EU without a deal. The MPs have tabled an amendment to the Finance Bill in the hope of stopping the government raising money to implement a no-deal Brexit, without the explicit consent of Parliament. The technical changes to a crucial piece of government legislation are intended to demonstrate to the government the strength of opposition to a no-deal Brexit in the Commons. Government sources warned over the weekend of “paralysis” and an effective “shutdown” if the Treasury was stripped of the power to pass regulations relating to “no-deal financial provisions” without parliamentary approval. Labour have said they will back the amendment, prompting speculation that ministers will be forced to accept it in order to avoid a damaging defeat. If the government does not back down, a vote on the amendment is expected at about 19:00 GMT. The UK is scheduled to leave the EU on 29 March whether there is a deal or not. The deal which Prime Minister Theresa May has negotiated with the EU – which covers the terms of the UK’s divorce and the framework of future relations with the EU – has not been formally approved. MPs will vote on 15 January on whether to accept the legally-binding terms of withdrawal negotiated by Mrs May, as well as a framework of future relations with the EU. Five days of debate in the Commons will begin on Wednesday.